Old advertising wisdom says pick two. In today's world, BBDO says pick three. The mounting pressure of new channels, an ocean of media, and sophisticated and fickle consumers tuning out everything that doesn't interest them means that brands need all three. So what happens when you put 10 creative teams into YouTube Spaces around the world and give them 48 hours to shoot, edit and produce videos that deliver on a global brief? And what happens when you test those films on YouTube to see how they perform in the wild? 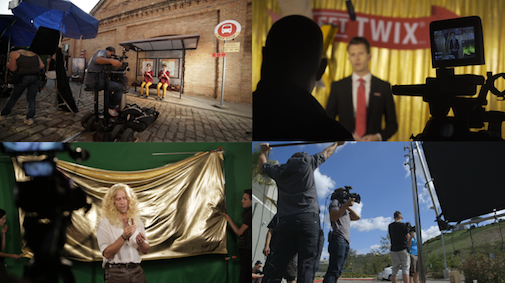 YouTube + BBDO + TWIXⓇ partnered on the Global Video Create-A-Thon -- a first-of-its-kind, hands-on experience to see what happens when you give 10 teams in four locations limited budgets and 48 hours to create work that resonates globally. Working with Mars and its iconic TWIX global brand, BBDO creatives from around the world were challenged to help TWIX translate its successful “Left TWIX/Right TWIX” fictional rivalry strategy into powerful storytelling that crosses borders. We sought to explore a new way to make content, faster and for less money, without sacrificing quality in today's fast-moving, mobile first landscape. Teams work in YouTube Spaces across São Paulo, London, New York, & Los Angeles. The ten films then ran as skippable pre-roll on YouTube across three international markets: US, UK and Netherlands. Each creative piece was evaluated for its ability to drive view-through rates and ad recall using YouTube’s TrueView skippable ad platform. A score of 10 was given to the highest performing ad on each of these criteria, and the best performing ad was determined by combined scores across all three markets. All 10 ads drove positive ad recall and five of them scored within the top quartile (25%) of all YouTube ads that have been tested since the launch of Brand Lift. You can view all ten ads here. Interestingly, there were no major geographical differences in the performance of the advertising across all three regions. Even with the constraints (time, budget, production), it’s possible to create compelling brand content that crosses borders when you have an insight that is truly global and visual storytelling, told well. TWIX is giving consideration to how best to use this successful content and will be applying the production learnings to future TWIX and other Mars brand projects. In the coming weeks, we’ll share more insights from behind the of scenes of this experiment. Watch this space for more.